i love mochi: $50 H&M gift card giveaway! 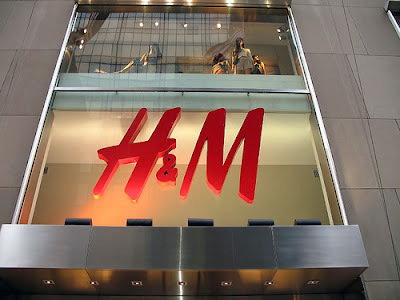 $50 H&M gift card giveaway! to thank my readers, i am hosting my first giveaway - the prize is a $50 gift card to H&M! the giveaway is open internationally, will end on May 16, 2011 at 12AM PST, and the winner will be selected using the random number generator at random.org. thanks everyone, and happy shopping! I am leaving a comment. I shall post about this in my next post, no worries. My favorite H&M item is their lace shoe this spring season, ballerina flats. My favorite outfit you posted, must be the "White Pants" with the scarf and the blue top. Love the combo. Congrats on gaining 50 followers! 1)Post your giveaway on my giveaway page and also on the side bar. Congrats on 50 followers. I follow you on Google. My favorite H&M Item would be my Pink plaid Shirt that I wear in my 30 for 30 and October breast caner Awearness. I am going to enter this give-away against my luck! I'm crossing all my fingers this time as I really want to win this! I'm a follower, yes I am! p.s. I love your newest post - that dress fits you perfectly! I have a headpiece from H&M that I wore to the Ottawa Fashion Week - loove! my favorit H&M item is the dresses i just love them. my favorite outfit you have posted is the(peephole pumps) loved it! wow, great giveaway! i follow via GFC! This is my favorite outfit of yours! following as yuusuke, enter me please! So glad I found your blog! It's adorable! I just followed. I added you to my blogroll, but it only shows the ten most updated blogs unless you expand my list. So yours will show when you post and continue showing until a tenth person after you posts. Then it'll show the next time you post. I hope that counts (my sidebar is just too long and I still need to clean it up). my favorite H&M item is their long sleeve stripe shirt. of course i follow you hun!! my GFC username is Sandy a la Mode and my email is sandyalamode(at)gmail(dot)com! btw, did you know you can look at H&M's new arrivals online now. I can't wait until they have an online store! AH! i follow your blog (of course) under Kileen Cheng. and my fave outfit of yours is your most recent one with the leather jacket and fishnets! i wish i was as brave as you for rocking the fishnets! and my fave H&M item is their coral dress from the Lanvin collection. I love this give-a-way!! I am a new follower as Emma Basilone! Love that skirt & the little peak of skin between the tights and shoes = adorable!! <3 how it is styled too! I tweeted (don't have a FB, crazy, I know! ;) ) about the giveaway! I love H & M 's sundresses! They have cute flower pattern ones that I am obsessed with! I love this outfit: http://ilovemochi.blogspot.com/2011/01/united-colors-of-benetton-skirt-banana.html! I like your blog, too..
my favorite item is H&M fashion against aids silver bag!!! I adore it!! Share this giveaway on Facebook here. I love your ~white tights~ post! What a fantastic give away, I'm in! I have this H&M trench like coat that I love! I love your black lace dress post! I follow you on GFC, name is Alexandra Rebecca. My email address is arcumley@gmail.com. My favorite item from H&M is lingerie. I love the post about swimsuit. hello! I followed you on GFC, which is the same username as my email address (aiwendillie(at)gmail.com). thanks! hi there! I followed through GFC with thecalidreamer. email = thecalidreamer (at) gmail (dot) com. I really liked your post called 'stripes anyone', that skirt is so cute! so my favorite item at H&M were these kind-of neon green/yellow flats. I only bought them because it was raining that day and I was stupid and wore flip flops. They were cute and comfortable, but didn't stand out too much--they surprisingly matched a lot of the clothes I wore. It looked especially cute with neutral colors like grey. i like your black lace dress.